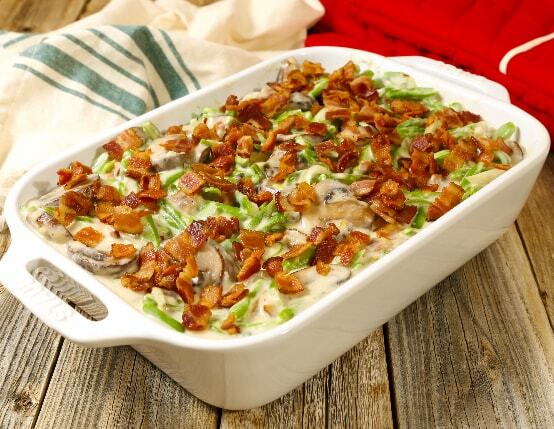 This is not your ordinary green bean casserole. 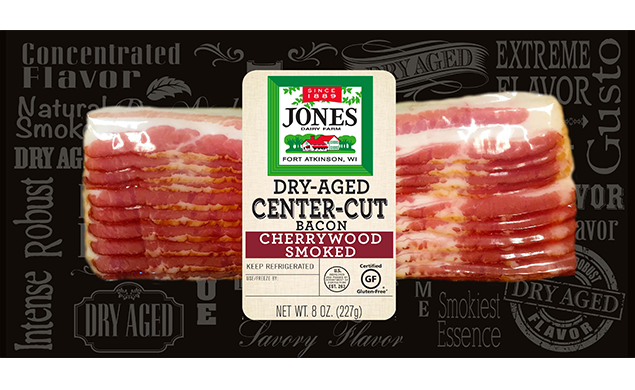 With fresh mushrooms, sharp cheddar and the rich, smoky flavor of Jones dry aged bacon, it’s nothing short of sensational. Mix 1/4 cup corn starch with 1/2 cup milk in resealable container. Seal and shake vigorously to create a slurry. Omit flour called for in recipe. Add remaining 1 1/2 cups of milk to the recipe. Cook until it starts to bubble. Add the slurry and stir to combine. Proceed with the recipe adding cheese and melting. Remove bacon from skillet with slotted spoon and place on paper towel lined plate. Set aside. Pour bacon drippings into jar to save for later use and return 4 tablespoons to pan. Return skillet to medium heat. Add mushrooms, onion and garlic. Cook vegetables until browned, about 5 minutes, stirring occasionally. Add 2 tablespoons bacon drippings, to pan (or butter if you are out of bacon drippings). * Add flour, salt, pepper and red pepper flakes. Stir until flour dissolves into vegetables. Cook 1 minute. Add milk and stir to combine. Remove from heat, add cheese one handful at a time; stir between each addition. Once cheese is completely melted add green beans and half of cooked bacon. Stir to combine. Top with remaining bacon. Bake bacon in the oven until crisp. Cool and crumble. Set aside. Add 4 tablespoons butter to skillet. Once the butter is melted add mushrooms, onions and garlic. Continue with recipe as written above.